This weekend Interweave Crochet is kicking off a celebration for the new Unexpected Afghans: Innovative Crochet Designs with Traditional Techniques ! I am so excited that I can finally tell you about this design. I loved every minute of this design. I started this design with the idea of making lace in a worsted weight yarn. When I got the call for this book, I knew I had to send it in. The swatch was done in the same yarn as the final project (so happy for that!) and it’s Universal Yarns Cotton Supreme. If you haven’t used this yarn, seriously, pick some up. It’s so smooth and silky and has incredible drape. Robyn was fantastic to work with and she picked a stunning color for the final project. I loved the bright pink. It gives it such a pop and a flair. However, any color you work this blanket in will be stunning (and change the look significantly). Don’t let the lace fool you into thinking it’s a hard pattern. It’s not. It’s a simple four row repeat that’s super easy to memorize. Because it’s in a worsted weight yarn, it goes super fast. 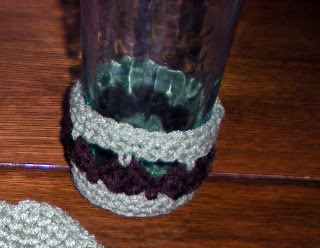 It really is a great way to introduce yourself to lace crocheting. And it’s not just for babies! This blanket turned out a bit big for a baby blanket, 39″ square. So it’s perfect for draping over a favorite chair and using to cover your lap or shoulders. I originally pictured this as a porch blanket, perfect on a porch swing on a cool spring evening. I do hope you’ll check out this book. Not just because I’m in it. But because it is so full of great designs from great designers. I have so many of these patterns marked to make at some point. There is some top notch work in here. Designs that are far from the typical patterns found in afghan books. Now, if you’re interested in winning an e-book version, just respond here by 11:59pm Eastern Time on July 4th with your name and an answer to this question: What’s your favorite technique for afghans/blankets?. Are you the big and lacy type? Simple and traditional? Motif? Back and forth? Also, check out the rest of the celebration at the links below! I hear that there will be giveaways there, too! Yay! I can finally tell you about this! Simply Crochet is now available in print (or you can get a downloadable e-book here). This book is jam packed with great patterns from great designers that I am honored to be in a book with. The best part of this book? It’s all about what to do with five balls or less of yarn. Great yarn. Yummy yarn. And, all of us have shared our tips and tricks on how to get the best bang for your buck. My contribution? The Blooming Beauty Purse. This cute little purse uses only three balls of scrumptious Filatura Di Crosa’s Zara yarn. This yarn was wonderful to work with. Super soft, great color, and crisp stitch definition. I had a hard time packaging it up to send. Because the motifs are open and lacy, you need to make a lining, but that’s super easy. And it gives you an opportunity to play with pops of color in fun fabric. I used two “fat quarters” that I picked up at my local fabric store. There are instructions on how to do the lining in the pattern. I’ll tell you a behind the scenes secret. Shh, don’t tell anyone else, this is just between you and me. I had my sister sew my lining for me. She has a better eye for this and I was close to my shipping deadline. And then the fabulous tech editor at Interweave worked with my faltering ability to explain what my sister did (and I had a hard time “showing” her what I did with just words in an email…lol) and wrote the directions for the sewing bit so anyone can follow it. Here, I want to show off how pretty the inside is. I love the fabric. I actually bought four different fabrics (fat quarters are pretty inexpensive so it’s fun to play with) and put each one inside the finished purse to see which I liked best. The red won out. You know what’s a fun idea? Put a nice neutral fabric on the outside of the lining (the part that will peek through your motifs to the world) and put a bright fun fabric for the inside. Because the lining uses two layers, you can fully customize it. Imagine the possibilities! The purse is a great take along project. You make the first two rounds out of two of the colors and then later put the third round in the third color and join them all together. So the first bit can be taken with you and then you can sit at a table or in your favorite comfy chair and join them together following the diagram. I’ll tell you another little secret. I didn’t know it would be that shape when I was joining it together. I had in my mind something else and it wasn’t until I joined the last two motifs and stepped back that I saw it was in this great shape. Sometimes happy accidents are awesome. There are 21 other designs in this book that are all awesome. I’m so honored to be a part of this book. Some of my favorite designers have designs next to mine. This is something that always makes me do the happy dance. This book is chock full of great designs, great tips, and is wonderful for stash busting. Now the fun part! I get to give away a copy of the e-book. This will not be a hard copy. It’s a PDF file that you can take anywhere (I highly suggest Dropbox, especially if you have a smart phone…there’s an app for that and you can carry the book with you!). Did you miss a post on the tour? Here’s the whole list of the tour. It’s like flipping through the book in order! I’m so excited to be able to tell you about two new patterns of mine that are out now! Both patterns use new yarns and so I get to tell you about them, too! 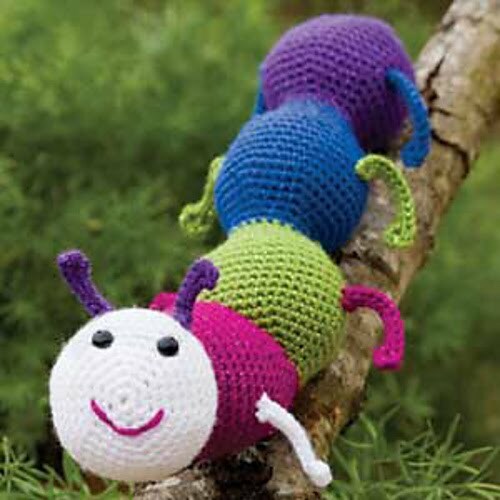 The first one can be found in Crochet World April 2011 issue. Glitterbug is made out of Simply Soft Party and came about during the Knit and Crochet Show last year. Michele Maks took my amigurumi class and we met afterwards to talk about designs. I sketched this out for her and had it to her a month or so later. I just love him so much! Let me tell you about the yarn. Simply Soft Party is all the goodness of Simply Soft with a metallic thread running through it. Now, metallic threads tend to feel itchy to me, but this is actually soft. How soft? Well, at that same conference, I had a crocheted chain of it (double stranded) around my neck as a choker for the Dance Party. I never noticed it on because it was that soft. The other great thing about the metallic thread? It’s the same color of the yarn it’s in. Which gives it a very subtle glitz. I really love it and can’t wait to design a few more things in it. So, I hope you’ll check out the April issue and give it a try. It’s a great beginner amigurumi pattern. The only sewing you have to do is to sew the legs and antenna on. The body is made in one piece. Oh, and here’s the Ravelry Link. The second pattern is a great home piece. It’s a quick project and can dress up the little storage ottomans that you can get at Target for under $20. It’s simple to make and works up fast because it’s a chunky yarn. The Granny Ottoman Cover (Ravelry Link) is made with the new Red Heart Super Saver Chunky. This yarn is just as hard working as regular Red Heart Super Saver, but in a new speedy weight. This will be a great yarn for making thick scarves and hats or quick afghans. Or, ottoman covers! I hope you check out both of these patterns and if you give them a try, let me know! I should hopefully have a few more patterns to show you soon. I’ve seen them in the newest Aunt Lydia’s catalog (oh, could that mean they’re thread items?) and once they get them up on the website, you will hear about them. Also, speaking of thread, there’s a CAL over on the Fibers By Tracie group on Ravelry for the Natural Beauty Wrap. We’re running until the end of April because we’re all so busy. I do hope you’ll come on by and check it out and join us! There will be prizes! Okay, gang, that’s all for this week! I hope you have a fabulous week! Good morning all! It’s Monday here, and a holiday, which means no mail and a lot of people have the day off. Not me, of course, because I have to write two patterns today to prep for shipping off projects before their end of month deadline. It’ll also mean I can clear off my white board because the center section has been FULL of projects. Again, good for bank account, bad for taking holidays off. Today I wanted to share with you the latest design that’s been published. Now, it came out a couple of weeks ago, but I had promised the dress form post, so you’re getting it now. Plus, I wanted to share with you what happened with this design. Let’s get the design stuff out of the way first. This pillow uses four balls of Red Heart Soft Yarn, an H-8 and I-9 crochet hook, and a 16″ round pillow insert. Make sure you check your gauge. I used just about the entire four balls, so if you think you won’t make gauge, then buy an extra ball. This pillow will look great in your home. Quick and relatively easy (it will get a bit fiddly near the end, and when you’re crocheting the pillow closed), I think it would look awesome in any number of colors. The back is not ruffled, and is attached to the front in the last round. No sewing! Although I suppose if you wanted to (or needed to be able to remove the pillow from time to time) you could sew it together and install a zipper or something. Now, this lovely pillow seemed so easy when I got the assignment. And it was. The construction concept stayed the same throughout the design process. It always seems that what should be the easiest design to execute is always the one to bite me every step of the way. This was the design that I ripped back four or five times during construction (I don’t remember and it pains me to look back through Twitter to see). This was the design that I often times daydreamed about setting on fire. To be clear, not because of anything wrong with the design (I love the final product)…it was simply figuring out exactly what needed to be done. Once I finally got through the roadblocks in my own head, I was able to quickly finish the pillow. The wonderful thing for you? 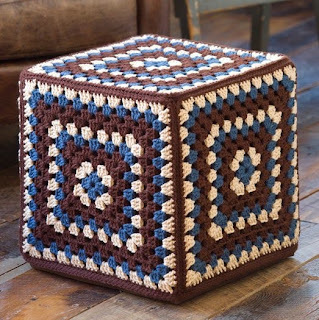 You simply get to pick up the pattern and start crocheting. All the hard part has been done. As long as you follow the directions, the pillow will simply fly off your hook. I share this with you because I’ve always been honest about the design process (see my designing series for hard truths and such). It’s not always sunshine and roses and unicorns. Sometimes there’s real blood, sweat, and tears that go into the designing process (I’ve had all three happen, thankfully never on the project itself). It’s important to me that crocheters understand what goes into the designs they use. Sometimes we’re lucky and it’s a quick design to create (those are usually the hardest to write the patterns for…just so you know that sometimes it’s a struggle either way). Sometimes we’re not. Either way, the hard work we do turns into a wonderful project for you to create. I do hope that you’ll give this one a try. If you do, let me know! If it’s on Ravelry, I’ll see it. I can’t wait to see it done in a few different colors. I think a bright color would look great on a neutral sofa or chair. Spring is on its way, so you should totally get this done for your spring redecorating. Next week I’ll have the wonderful Karen Ratto-Whooley here and we’ll be chatting about her newest book: I Can’t Believe I’m Crocheting Socks. I’m almost done with my first sock from this book and I can tell you, her instructions are clear, detailed and wonderful. I’m hoping to finish at least one sock this week so I can show it to you next week. If you love crocheting socks, or were always interested in learning how, get this book when it comes out. You won’t be disappointed! Come visit me next week to meet Karen and read our little chat about it. I have been very anxious to tell you about this design. It is one of my most favorite designs (currently) because it came out so well and I was able to do something I’d never done before. Red Rocks Wrap (Ravelry link) in Interweave Crochet Winter 2010. The yarn is Zitron Noblesse and was incredibly awesome to work with. 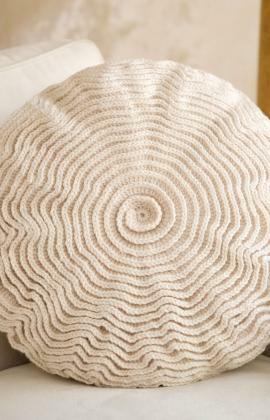 It’s a merino and silk blend and the tonal qualities of the yarn really made this project sing. I adored working with this yarn and probably will do my best to get my hands on some more. Mmmm. This is a Tunisian project. But, here’s the thing. Even if you’ve never done Tunisian before, I promise you that you can make this. How can I do that? Because this was my first ever Tunisian project. More on that later. This wrap is done with no seaming (I really hate having to sew things together), and uses an 8.0mm Tunisian hook for the bulk of the crocheting, and then an 8.0mm (L) crochet hook for the edging. Six one inch buttons finish off the wrap beautifully. I used wooden buttons that had this neat square cut out in the middle that matched the way the Tunisian simple stitches looked. 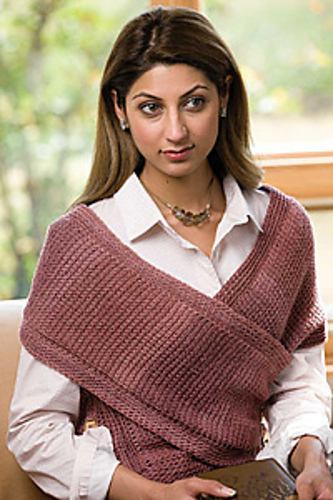 The Tunisian simple stitch gives it a waffle effect that makes it very lightweight, but very warm at the same time. It’s perfect if you’re like me and want to stay warm by keeping your core warm. Because it buttons closed, you’re not fussing with shawl pins or clips and can keep working. 2. This is also my first adult garment I did sizing on (the Granny Square Shrug I did last year was motif based and I kinda cheated by using different hook sizes to adjust the sizing). 3. Hello, it’s in Interweave Crochet! Yes, I had the Victoria’s Choker Necklace in their Accessories issue. But this is in the regular cycle of the magazine and is a much larger piece. And yes, getting into Interweave was on my goal list. 4. It turned out better than I saw in my head. Now, I’m very lucky that this often happens for me. I can see a design in my head, make it out of yarn (or thread) and am often surprised that it not only comes out like I saw, but sometimes even better. This, though, this blew me away. 5. It photographed way better than I thought. Unfortunately, when I finished the sample, I had no way to try it on a live human. My mannequin was too small (and doesn’t have shoulders or arms which are needed for this) and my niece was a bit too big for it. So I sent it off with a plea to the Universe that it be right. I was very anxiously waiting for the photos to show up so I could see how it worked out. I was blown away by it. Seriously. 6. This was my first ever Tunisian project. I’d dabbled with it in swatches to learn the technique, but this was the first real project I’d ever done. That’s a bit daunting (and probably kinda stupid), but it’s proof that even with no Tunisian experience, you can make this. So, I hope you’ll enjoy this design and maybe even make one for yourself or as a gift. 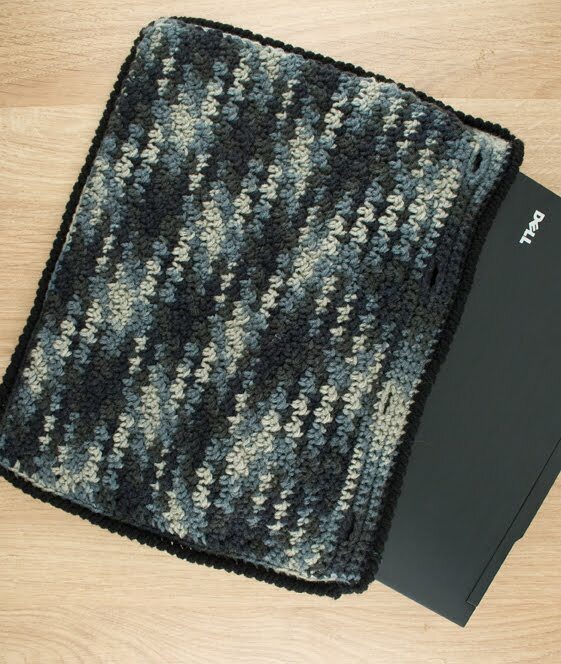 I’m probably going to remake it for myself since it was really easy (and a great TV watching project once you get the hang of the Tunisian simple stitch). If you’re lucky enough to have an iPad (I’m not, that may or may not be a hint, I haven’t decided yet how bad I want one), you probably want a cover for it, right? Well, if you’re reading this, then I’m going to assume you’re a crocheter (unless you’re family and reading to keep up with all I do…hi!). So why not crochet your own cover? It’s super easy and hey, look, I wrote a pattern for it. 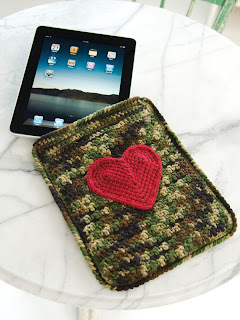 Presenting the Love my iPad Case (Ravelry Link). Uses just one skein of Red Heart Super Saver (and the sample was made in camo, which is less yardage than a solid, so you’re good to go with any color) and a small amount of a contrast color for the heart. I made it in two days. And that was with figuring out measurements and such. You get to just follow the directions, so it’s a quick and easy last minute gift. Or use it to wrap a new iPad for someone. You’ll also need two 1″ buttons for the closure on the top as well as sewing thread and needle to attach them. The finished size is 8″ by 10″. I loved making this necklace. I fell in love with the idea over a year ago and it took a while for it to find the right home. It’s a really quick crochet project and will finish off any outfit. It’s also perfect for gift giving because it’s so fast. And it uses way less than a ball of thread (I think you could easily get 3 or 4 necklaces out of one ball…probably more). The little seed beads on the ends give it a bit of sparkle. I can’t wait to see how everyone personalizes these necklaces for themselves. I plan on making one in black with larger beads and perhaps one in purple (since it’s my favorite color and I wear it all the time). Oh, and the fans of the necklace stop at the shoulders, leaving just the “chain” of the necklace along the back. This lets it sit comfortably at the neck and not bunch up around the back. New patterns in a new book! I just got my contributor copy of Vintage Crochet for Your Home by Coats & Clark. I have two patterns in this book. This was a really fun project to work on. I was asked to adapt two vintage patterns into today’s terminology using today’s yarns. I did two kitchen style projects. One was a placemat and glass holder project, and the other was a pineapple hot mat. The Shell Stripe Placemat & Glass Holders (Ravelry link) is a really quick and easily customizable project. I think this would make a great housewarming or wedding gift done in the recipient’s kitchen or dining room colors. The glass holder was fun to do because I remember my grandmother and great grandmother made glass holders for the families when I was a kid. The yarn is Red Heart Super Saver in Tea Leaf and Coffee. I have grown to really like these two colors together. The yarn is washable, making it great for a kitchen/dining room item. A funny thing about why the pictures are separate. When I first did the mat, I did it to the specifications in the original pattern. Only it was too small for the standard plates we have now. So I had to adapt it to make it larger. 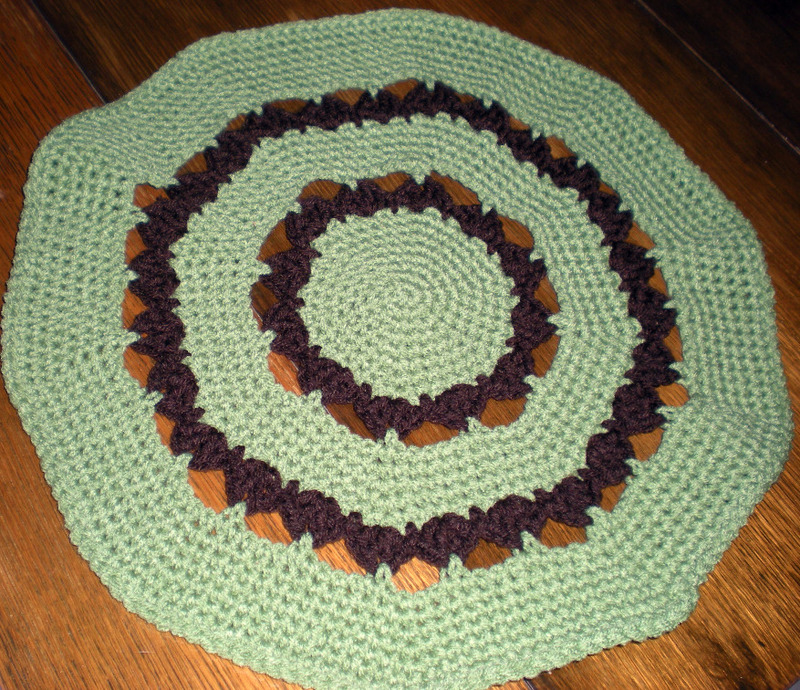 The Pineapple Hot Plate Mat (Ravelry link) was another fun project. Thankfully, my little weird quirk of saving bottle caps worked in my favor for this project. I had no trouble gathering 52 metal bottle caps. 🙂 Believe it or not, this is also a quick project. It’s easy to get into the flow of covering the bottle caps. They’re assembled after all of them are covered. You could also do other shapes by mixing up the colors. Now, the book itself. This is an awesome book. It has a great collection of updated items that many of us grew up with. Maybe I’m just nostalgic this week because I just received a box of items that my late grandmother crocheted (and some of her hooks), but I respect and love crochet’s roots. And yeah, I like my fair share of kitsch. Oh, and symbol crochet people? There are symbol charts in this book. Wait, let me say that again. THERE ARE SYMBOL CROCHET CHARTS IN THIS BOOK! Okay, did you hear it that time? How awesome is that? The photography is stunning, the write ups are great, and I can see a bunch of patterns I would love to make (you know, when I have spare time). There is also a very detailed “how to crochet” section in the back with great diagrams and tips. Oh, and I did mention my grandmother’s crochet, didn’t I? Well, that will be another post. I’m still teary eyed when I think about what I’m going to write regarding these items. My grandmother was a very talented crocheter and I am heartbroken that I never got the chance to sit at her feet and learn from her. I’m blessed to have some of her items and her hooks. So, keep an eye out for that next week sometime. And the next installment of my Designing Series will be on Monday. Ooh, look, a bonus post from me! 🙂 Trying to stay on top of these things now that I’m not drowning in deadlines. Anyway, Coats and Clark announced the other day that the Side to Side Scarf I designed for them is up on their website. This is a great scarf for beginners to try their hands at something a bit lacy. It’s also great for intermediate and advanced because it works up quickly for gifts or for charity. The sample is made in Red Heart Super Saver Multi: Primary. Also, it only uses one skein! Side to Side Scarf (Ravelry Link). Hope you all enjoy the pattern! And remember to stay tuned for the next installment of my Designer Series, coming out on Monday! So to say it’s been a busy couple of months would be an understatement. As evidenced by my lack of posting, this has been an absolute crazy time for me. Which has been great for ye olde bank account, but not so much for eeking out time to post or do much of anything else. Now that things have calmed down, I’ve redone my office hours schedule and promise to spend Mondays (the day I have the hardest time getting focused into my crochet work) updating computer stuff. Including this blog. So, keep an eye out for some interesting posts coming up (including that forever ago promised series on designing). For those of you wondering what’s been going on, well, a lot of it I can’t talk about yet. But I will have a lot of exciting news in the next year. I can’t wait to share it with you, but as always, it has to wait. I can, however, show you a few designs I’ve done over the last year that have been published. Laptop Case (Ravelry Link) I made this for Father’s Day for Coats and Clark. It’s a super quick project and would be great for anyone in your life. It’s got a very subtle texture to it. Seaside Squares Baby Blanket (Ravelry Link). I love this little blanket. It works up quickly, and the yarn color was awesome to work with. If you need a quick baby shower gift, this is a great one. This is also available through Coats & Clark. Forget-Me-Not Baby blanket published in Crochet World presents Afghans! (Ravelry Link). It’s a filet crochet blanket, and great to do if you love the effect of filet but don’t want to work in thread. I think it would look great in any color. Once you’ve got the pattern established, it’s easily memorized. There is a chart included in the magazine. Okay, so there’s at least three more patterns that are coming out in magazines here in the next few months. And I will post as soon as they are. They’re very exciting. For now, I’ll close and tell you to keep an eye out on Monday for a post. I’ll be starting the Designing series on Monday, so there’s still time to ask questions! I’ll answer them in my posts.